Posted on July 22, 2014 by E.M.
Man, did the press make a big deal about all the problems Brazil would have hosting the World Cup or what? I’m glad we didn’t listen and went anyway: the whole experience was perfect! It was nice to be able to stay with my aunt, but it was even nicer that she lived right across from the hotel where the US players were staying. And it gets better: my cousin M. is the assistant manager of the hotel that hosted the Portugal team. So we got to see and hear (helicopters and police all over) when the US team went in and out of the hotel and then my cousin would bring us the latest on the Portuguese players: did you know Cristiano Ronaldo (2013 best soccer player of the year) likes to take a bath with white rose petals before a game? On the day of the USA vs. Portugal game, we went in front of the hotel to wish the US players good luck. Although there were lots of curious eyes around, the boyfriend was the only American yelling “USA”. We got to see the goalie Tim Howard, the dreadlock hottie Beckerman, and the captain, Dempsey, who had broken his nose in the previous game. My cousin A. dropped us off the closest he could get to the stadium (Arena Amazonia), which was still a couple miles away because of all of the closed off streets, but we didn’t mind walking: the energy was almost palpable. Getting into the stadium was super easy too: there were no lines and everything went very smoothly. So impressed with the organization! The game was a good one. USA needed a win to automatically move on to the next phase, while a draw wouldn’t be too bad either. Portugal needed a draw or a win to be kept alive. A loss would mean they would go home automatically. Portugal scored first, although not with a goal by Cristiano Ronaldo, their most famous player. Then US scored two goals and we thought we were going to win, but on the last SECOND, Portugal scored another one… Actually, a score of 2-2 wasn’t too bad: both teams left happy and we left for an all-you-can-eat soup feast nearby. 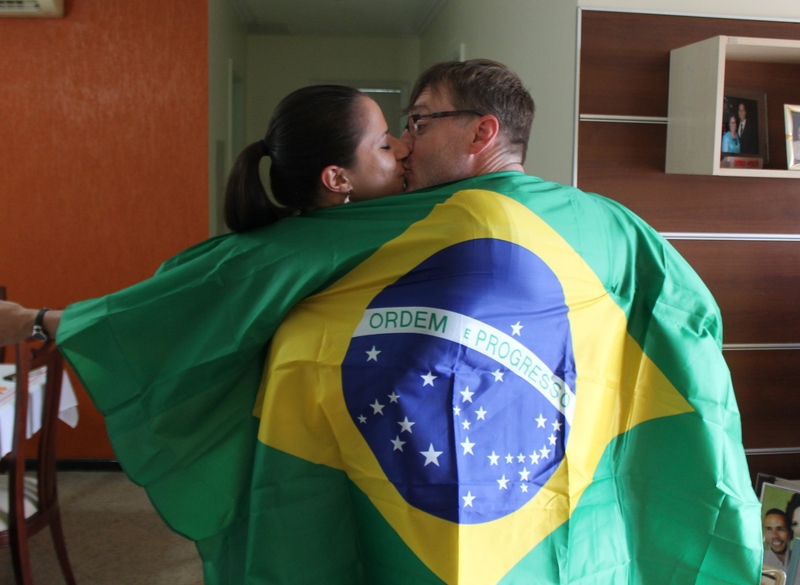 The next day there was a Brazil game and we decided to be where all the action was: FIFA Fan Fest. In each host town, FIFA would close off an area for spectators to watch each game on several screens. In Manaus, this fest was in Ponta Negra, a nice area by the beach. Just to get in we had to stand in lines and go thru multiple security checkpoints. Once in, we notice how there were more than 40,000 people in the area, which was supposed to be the limit. There were probably double of the people there, the noise of the horns was deafening, and the heat was unbearable. We barely found a spot to watch the game. But it didn’t matter: the Amazon jungle was surrounding us and the experience of a lifetime in Brazil was already unforgettable. All USA games were awesome!